5 Car Parts At Risk When You Bottom Out Over A Rolled Curb.. AND.. The Solution. If you see these signs, don’t ignore them. Check your oil pan and consider ways in which you can scrape less often. When you bottom out, it is often your front splitter that takes the most damage. While your car can endure minimal and infrequent impacts, over time your splitter can crack as a result leading to expensive repairs. In some cars, you can replace the splitter relatively easily and cheaply. However in some cars the splitter is a part of larger components like the bumper or fascia which can cost a great deal to replace. Mufflers are another frequent victim of bottoming out. Mufflers are required by law to reduce noise and can cost $100-$500 to replace, plus installation fees. In fact one of our latest customers told us about how he’d just been ignoring every time he scraped going over his curb. He was unaware his skid plate was slowly loosening until it became unhinged during a road trip. He rigged it up and hit the highway again only to have it become unhinged again while driving through a thunderstorm. He pulled over to check it and when his car began sliding across the wet grass uncontrollably into a ditch, only to stop feet away from causing serious damage to the rest of the car and possibly himself. So he had to get towed in the middle of the storm and pay the towing guy some cash to help him get the skid plate un-jammed and removed entirely. Then he had to go to the auto repair shop to get a new one and have it installed. Lesson: ignoring skid plate damage can have some pretty terrible unintended consequences. 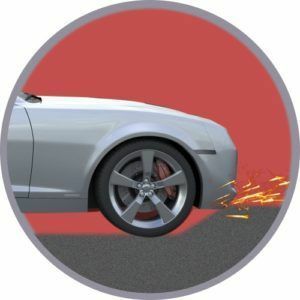 Persistent impact to your bumper or even a single rough jolt can cause serious damage. In addition to being unsightly, since bumpers are often fused with side panels, fascia, lights etc, damage to one can necessitate replacement of all..
We wouldn’t bring all this up without a solution would we? 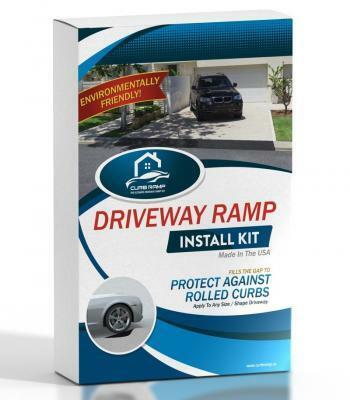 Curb Ramp™ creates a smooth transition between your home’s driveway and the pavement to help you glide over the gap in your rolled curb without causing damage to your car. It comes in a convenient, easy-to-install kit with the components needed for installation. You just mix it up and spread it over the desired area at the desired angle. When it dries, the finished material is similar to that of a professional running track or playground surface. It is highly durable and costs about half of pre-made rubber curb ramps. Save some dough and save your car, and in about an hour you can install Curb Ramp™.